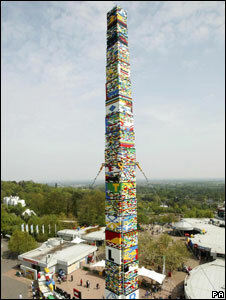 A 100ft tower made out of Lego bricks will be verified as an official world record, organisers hope. Thousands of children and their families used almost 500,000 bricks to build the structure at the Legoland theme park in Windsor, Berkshire. The tower is designed to resemble a Viking longboat mast to mark the opening of the new Land of the Vikings. It is yet to officially verified, but the next biggest Lego tower is just over 96ft built in Toronto last August. The Viking mast tower was created over the Bank Holiday weekend with each of the top sections lifted into place with a crane. Lego has recently celebrated the 50th anniversary of the iconic brick. Penny Jenkins, the park's special events manager, said: "We are thrilled to [hopefully] bring the world record to Legoland Windsor after four days of hard work, not to mention nearly 500,000 bricks. "It has been a great way to celebrate the 50th anniversary of the Lego bricks." In January 1958, Lego's Danish founder Ole Kirk Christansen secured the patent for the modern day brick design. The toy has gone onto to become one of the biggest sellers in history.